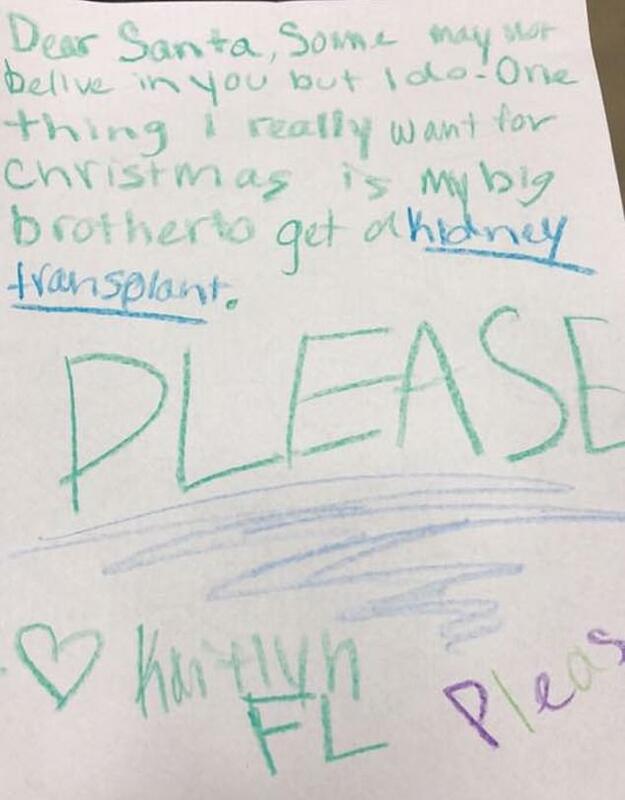 A little girl has written a heart-wrenching letter to Santa Claus, asking for a new kidney for her brother. The letter was dropped off at a Lowe's Home Improvement department store in Franklin, North Carolina, which has a mailbox where children can leave notes for Santa. Aside from her name, Kaitlyn, the identity of the girl remains unknown - but her letter has now gone viral with store employees hoping they can find her family and provide them with support. Store manager Shelly Thomas told DailyMail.com that she was cleaning out the mailbox on Friday, November 23, as she does on a daily basis when she came across the letter. 'We take the letters out and sometimes we read them because you never know what the big item will be this year,' she said. Thomas said she first tried looking through video surveillance footage to try to track down the parents or the child, but there was no luck. After getting clearance from Lowe's marketing manager, Thomas posted a photo of the note to Facebook. So far, the post has been shared nearly 900 times with some well-wishers saying they're willing to be tested once the family is found. Next to Kaitlyn's name is 'FL', leading to Thomas believe the girl's family may have been visiting from Florida. 'We haven't been able to reach the folks but what I really hope is that we find them, give them support, let them know someone cares,' Thomas said.